Summer NAMM 2008 was a busy show for Tama, and the company will be the first to admit that it "customarily trots out limited edition products to generate buzz" and to "test the market waters". So it's no great surprise to see three more limited edition drums (two Artwood Customs and a Metalworks) joining the line-up of previously reported hand-engraved snares. 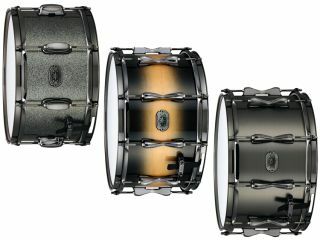 The two new Artwood Custom snares come in 8"x14" with a Dark Desert Burst finish and 7"x13" in Silver Shadow Sparkle. Both feature a 6mm maple shell and are limited to 100 and 250 pieces respectively. The Metalworks snare is 8"x14", features a 1.2mm steel shell finished in Brushed Black Nickel and is also limited to 100 pieces. The 8"x14" Artwood (AM1480BNBDDB) has a list price of $549.99, the 7"x13" (AM13708NBSSS) is $499.99 and the Metalworks (ST1480BNB) will set you back $469.99. Unfortunately, these limited editions become even more limited for many of us because they're only available in the US.